Michael C. Carlos Museum – Coastal Plain Regional Library System Updating & creation of sub pages will be happening during the month of March and April. Thanks to a partnership between the Michael C. Carlos Museum and the Georgia Public Library Service, Georgia families can now enjoy the museum’s exquisite permanent collections and renowned special exhibitions showcasing arts and culture from around the world. 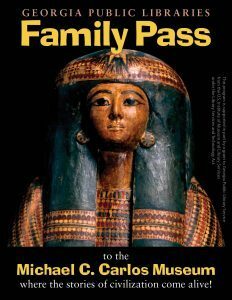 Through the partnership’s Family Pass program, families can visit the museum for free. Individuals and families with a valid Georgia library card can now check out a Family Pass to the Carlos Museum for six people at more than 400 participating libraries across all 159 Georgia counties.